Need a Mechanic in Blackrock? 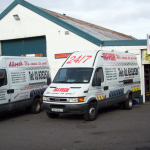 Based minutes from the M50, AllVech is ideally located for mobile mechanic services throughout Blackrock, Dublin 4. Our fleet of mobile mechanics in Blackrock provide 24/7 Roadside Assistance for Breakdowns, Emergency Jump Starts, Mobile Tyre Fitting and Vehicle Recovery.